I’m a dessert junkie, especially for a good cobbler like this yummy pear cobbler recipe. However, I don’t like spending a ton of time in the kitchen slaving over the stove-top mixing and mixing to make a yummy treat. I’m all about easy. That’s why this Pear Cobbler dessert is a total win in my house. We always have these easy, basic ingredients on hand and it makes a unique and yummy dessert with very little effort. It takes cooking from daunting to totally do-able! This post is sponsored by CansGetYouCooking.com. All opinions are my own. Preheat the over to 350° F.
Melt your butter in your baking dish. 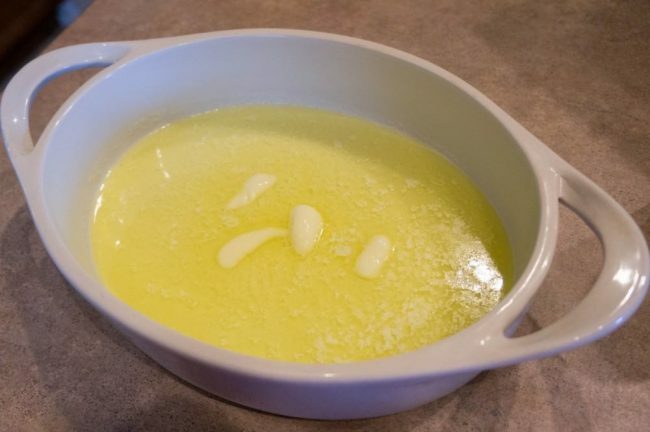 If you have a oven and microwave safe dish, just pop your butter into the dish and microwave for about a minute, or until your butter is melted. I love a good stoneware casserole dish that can go from the microwave and oven to the fridge. Mix together in a separate bowl Bisquick and sugar. Add milk and whisk together until well combined. Add the mix to your butter, stirring just slightly. Drain and scoop out your Del Monte Pear Halves, adding them to the top of the mix by hand so they are evenly spread. Do not mix, you want the pears to sit at the top of the mix. Pop the dish into the oven and bake for 30-40 minutes, or until lightly brown. Allow your easy Pear cobbler to cool, and then sprinkle with cinnamon sugar and serve. You've got to try this bisquick cobbler based easy recipe! 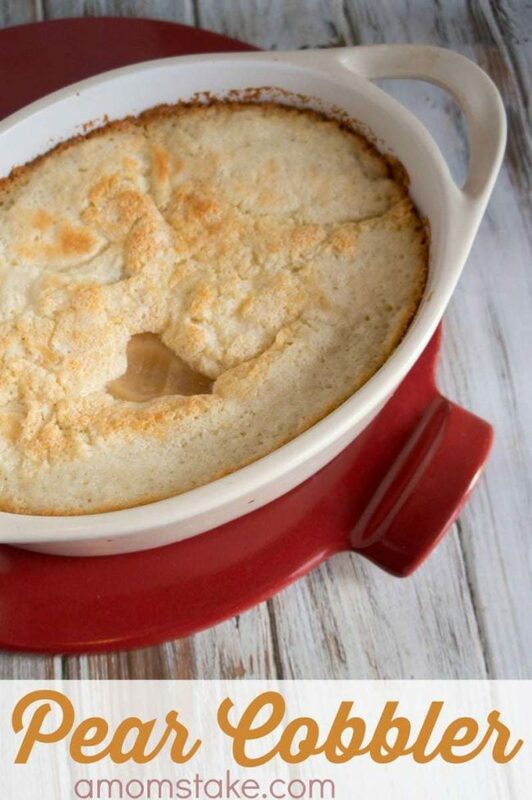 If you've never tried a pear cobbler, you're going to be so glad you did! Canned Pear Cobblers Saves the Day! We really enjoy having friends and family over for dinner, but as soon as we open our fridge it becomes a scramble of trying to figure out what we can make. That’s when turning to my canned food because my lifeline! Using canned fruits and vegetables can seal in their flavor and nutrition as the produce is picked right at the peak of the season so they are perfectly ripe and canned within hours to lock in the nutrients, too. Best of all, though, is how easy it makes cooking from home. 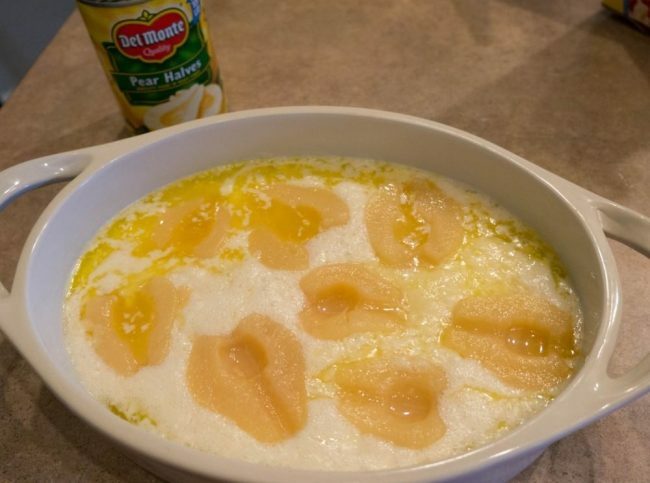 I’m sure you could make a wonderful pear cobbler with fresh pears, but it would be a LOT more work. I’m not opposed to skipping a few steps and making a dessert that takes just a few minutes to prep and then pop in the oven so I can get back to spending time with my family. Plus, it means this is a dessert we can serve year round, not just when pears are in seasons! If you love a good bisquick cobbler, you’ve got to head over to grab our Peach Cobbler with Cake Mix recipe next!! 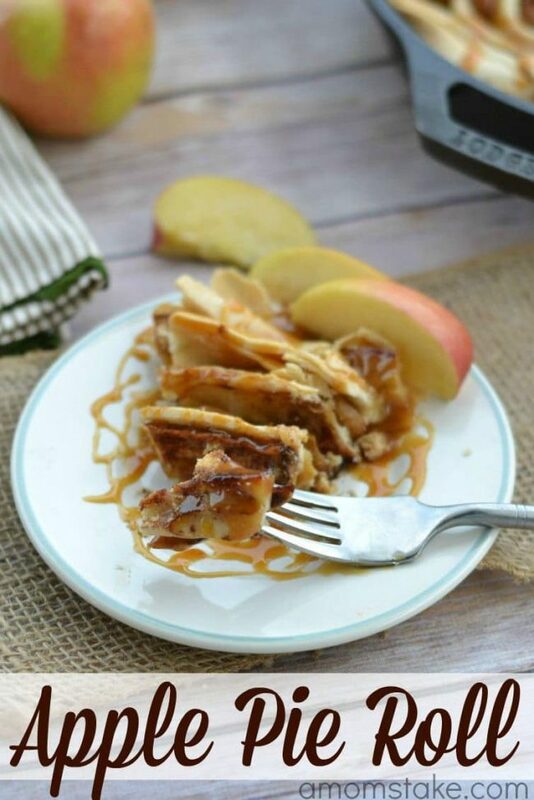 Pop over next to see our Apple Pie Roll, we love this unique recipe that takes a new twist on apple pie! Subscribe for more great recipes! Do you prefer pear cobbler or another Bisquick cobbler? 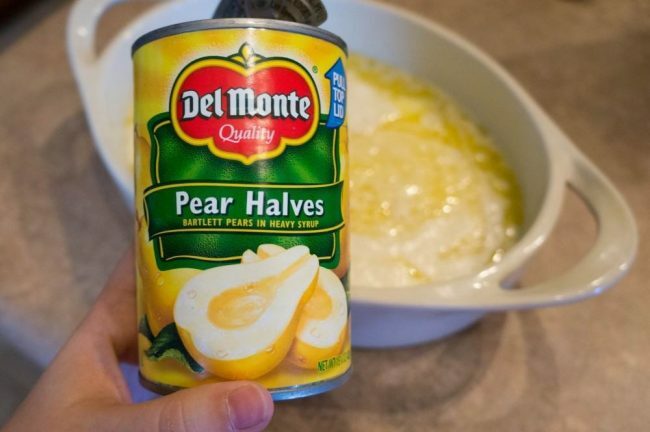 Yes using cans get me cooking more often, and I love this simple pear dessert! It looks so delicious and I will be making it! I have never had pear cobbler before. I love peach cobbler so I bet this is great. OH how simple. I haven’t eat pears but I wonder if this would work with peaches. This looks so good! I love making apple cobbler- I’ve never tried my hand at peach! This Pear Cobbler looks delicious. I have all the ingredients so i think i am going to try this recipe right now. The key is time and money saving for sure. A lot of people turn up their nose at canned food, but it’s tough to beat the convenience. I usually don’t purchased canned items, but this cobbler looks too good to resist! That looks delicious!! My husband loves cobbler, I love how easy this looks to make! That looks delicious! I will have to make it for my family for a sweet, after dinner treat! Pear cobbler is so good. I want to try this. It’s the best when it’s still warm! Mmmm! That looks so good! I love cobblers and pears are one of my favorite fruits. I’ve got to try this! We LOVE cobbler at our house! 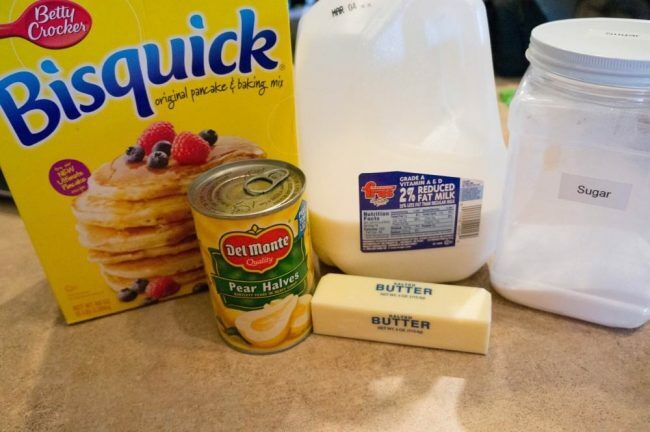 What a great idea to use Bisquick – Looks so tasty! This looks and sounds so delicious!! I want to try this. This looks really yummy! I can’t believe it is so simple to make! That looks so good! Now that I live in Florida, I’m hoping to see cobblers like this coming my way! I have never had a cobbler before, but I know I would love this. I’ve never had pear cobbler, but it looks absolutely delicious. I need to try this one, thanks for the recipe! OH yum that looks really good! I usually make peach but want to try pear. OMG, I LOVE this. I have a friend who’s originally from the south, and he ALWAYS makes cobbler like that. Yum! 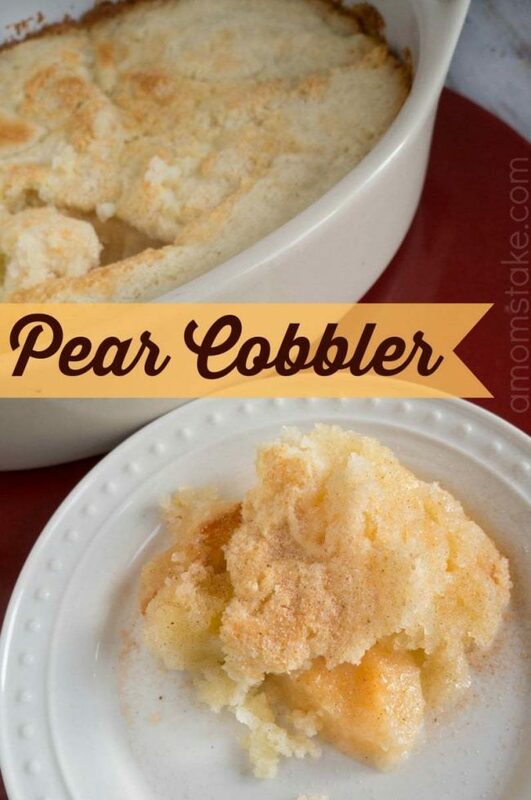 I’ve never had pear cobbler, but I love pears so now I want to try this!